Evans High Performance NPG provides superior cooling protection for all gasoline and light duty diesel engines, including marine and light aircraft. In conditions ranging from -40˚ to 375˚F NPG+c provides cooling protection through constant liquid coolant contact with engine metals. Eliminates water-causing corrosion, electrolysis and cavitation. 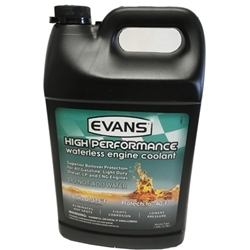 Once installed Evans provides cooling protection for the life-time of the engine, reducing maintenance time and expense. For those with vintage applications one of the most significant benefits is the elimination of the stress to block casting. Our jeep engines are prone to crack internally because of the thermal stress created over the last 50 plus years. That stress is eliminated with Evans because of its 370 deg boil point. With traditional coolants there is alway micro boiling occurring which leads to different expansion rates in the casting. It is this temp differential which causes the stress. With Evans you will have little or no temp differential. Protect you non replaceable original engine block today with Evans.